Your Facebook home page gives you two views to help keep up with family and friends: News Feed, which is an aggregated and summarized view of your friends’ activity, and Live Feed, which is a constantly updating real-time view of what people are doing. News Feed and Live Feed are meant to be complementary. In other words, while News Feed may be interesting first thing in the morning, once you’ve read all of it, Live Feed will keep you updated as things happen. On the flip side, if you’re busy and can’t keep up with everything that’s happening with Live Feed, News Feed will make sure you see the important stuff. You can switch between News Feed and Live Feed at any time by clicking the links at the top of the page. If one of your friends posts too frequently or too obnoxiously, you don’t have to avoid your home page. 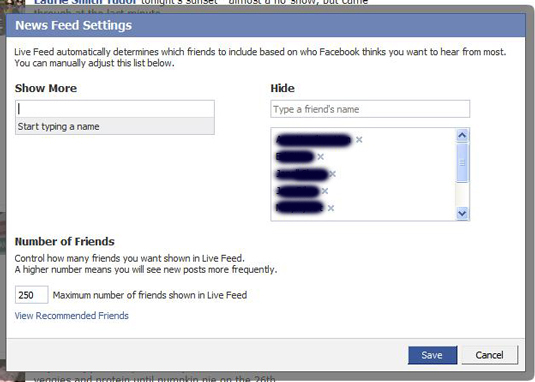 Here’s how you can “hide” someone from News Feed. From the Live Feed view, scroll all the way down to the bottom of the page. Click Edit Options. This brings up a dialog box to Edit News Feed Options. Type the names of any friends you want to hide into the “Hide” box on the right. This doesn’t remove the friendship, just makes your Live Feed a little bit more manageable. If you have a lot of friends (and it’s okay if you don’t), you can make sure your most interesting ones always show up by adding them to the “Show more” box on the left. You can also increase the number of friends who appear in Live Feed, which will mean more stories will move through your home page on any given day.